Have you ever wondered what you could do with more money? What about if you lost money or time or employees; how would you get things done? Decision Lens understands your worry and offers a possible look into those scenarios with our Pareto Table. Given the holiday this week, let’s look deeper into the scenario from a Thanksgiving dinner point of view. Imagine you have a grocery list of items to pick up, ranging from things that you need, to things that you just want. You most likely have a budget to stick to and can’t afford everything on the list. As you can see in the image, there are certain items that fall on and off of the table as your budget increases. So when you are at the market this week or even out Black Friday shopping, try to imagine what you could buy with just a little extra money, but also try to imagine some of your money being unavailable and how that affects your purchasing priorities. 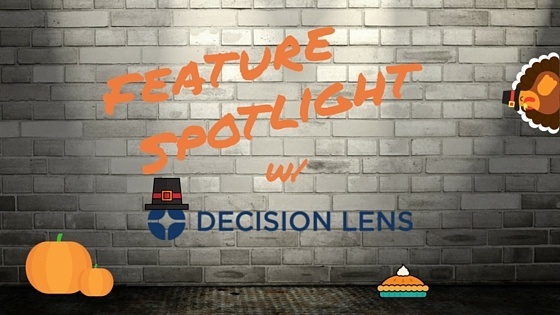 Happy Thanksgiving from Decision Lens!